Around the middle of the 11th century the position of Florence in Tuscany became even more important because Lucca was no longer the seat of the marquisate and because of the city's decisive participation in the movement for the reform of the church. The struggle to eliminate secular interference in ecclesiastical affairs and the affirmation of the independence of the papacy from imperial power were to have their leading representative in San Giovanni Gualberto, the son of a Florentine knight, who founded the order of Vallombrosa.In 1055 Florence even played host to a council, under Pope Victor II with the presence of Emperor Henry III and the participation of 120 bishops. It is not unlikely that the occasion (of the Council) prompted the enlargement or partial reconstruction of the cathedral of Santa Reparata. Other old structures were also rebuilt during the second half of the 11th century: the Baptistery, Santa Felicita, San Lorenzo, San Pier Maggiore, San Remigio and the Santi Apostoli. Some of the buildings mentioned above were the earliest examples of the Florentine Romanesque style characterized by a particular fidelity to antiquity. An artistic concept which demanded that architecture express itself in clear geometric forms capable of revealing their rational basis with immediacy was thus born. 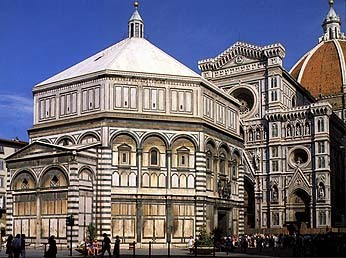 The building which, "par exellence", expressed this preference for geometric form and for the definition of spatial values was the Baptistery which has to be of enormous importance for the history of the figurative arts in Florence. S. Giovanni became a sort of paradigmative exposition of the Florentine conceptive of architecture, bound in so many ways to a classical idea of space, seen as form rathen than force. On November 6, 1059, Bishop Gerard, who had become pope under the name of Nicholas II, reconsecrated the ancient baptismal chuch of the city which had been rebuilt in more imposing form, much like what it is today. The building, octagonal in plan, with a semicircular apse on one side and three entrances, seems to have been covered by a pointed-arch dome divided into eight sectors. The outside was not yet faced with its fine marble casing, but inside it presumably already had the trabeation, at least on the lower level, which rhythmically scans the sides of the polygon. The two porphyry columns presented to the Florentines by the Pisans as thanks for the services they rendered Pisa during the Balearic enterprise did not arrive until 1117, too late to be used. After the death of her mother and of her husband (Geoffrey the Bearded), Matilda, daughter of Countess Beatrice, became the sole countess of Tuscany. She had always adhered to the ideas of the Reform and the policies of San Giovanni Gualberto and during the struggle for investiture she gave her support to the most influential of the reformers, Hildebrand of Sovana who later became Pope Gregory VII, thus finding herself in open contrast with the emperor, Henry IV. After the episode of Canossa, Henry IV's victory in 1081 led to the official deposition of the Countess who was abandoned by all the Tuscan cities except Florence. This faithfulness to the deposed Countess cost the city an imperial siege in July of 1082 (the first important military action the Florentine city was involved in) which however failed. Matilda's special attachment to Florence and the consequent rupture with the emperor led to the construction, in 1078, of a more efficient system of defense and the city was supplied with new walls - those which Dante was to call "la cerchia antica". This fourth walled enclosure for the most part followed along the lines of the Carolingian walls but on the north included the Baptistery, the cathedral of Santa Reparata and the residence of the Countess. The course of the 11th century walls can still be seen clearly in the urban layout: from the "Castello di Altafronte" (now Palazzo de' Giudici), set on the Arno, the walls followed the alignment of Via dei Castellani, Via dei Leoni, Piazza San Firenze and Via del Proconsolo, then turning west towards what is now Piazza del Duomo, and continuing along Via dei Cerretani, Via Rondinelli and Via Tornabuoni, as far as the church of Santa Trinita, at which point it once more turned and followed a route parallel to the course of the Arno along the line Borgo Santi Apostoli - Via Lambertesca, returning to Castello d'Altafronte. The course of the Mugnone was moved to the south so that it could serve as a moat for the walls on the western side and the stream ran into the Arno approximately where the bridge of Santa Trinita now is. In this period the city was divided into quarters which took their names from the four main gates: the Porta San Piero on the east, the so-called "Porta del vescovo" to the north, the Porta San Pancrazio to the west and the Porta Santa Maria to the south. Remembrances of the fourth gate are still to be found in the city's toponymy as in Via Por Santa Maria or Via Porta Rossa which took its name from a postern or secondary gate in the southwest corner and which was called Porta Rossa because it was built of brick. Like all the early medieval cities, the town plan of 11th century Florence must have been characterized not only by the recovery of its antique urban structure (walls, various remnants of roads) but by a basic homogenity, expressed in a casual distribution of the various landmarks. 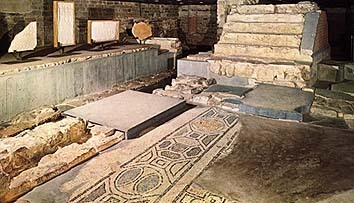 There were probably no open public spaces of any great size, with the exception of the market areas, the largest of which occupied the site of the ancient forum; the squares documented near the main churches were probably simply extensions. The urban fabric must have been composed primarily of wooden houses and only an occasional towerhouse in stone set on the foundations of a Roman building loomed up against the sky. 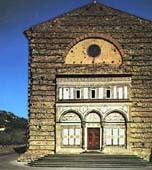 The principal landmarks were doubtless the religous buildings: besides the Baptistery and Santa Reparata and the other old establishments, several churches stood outside the city walls along the roads that led away from the gates: San Pier Maggiore, Santo Stefano al Ponte, Sant'Apollinare, Santa Maria Novella, San Felice, the church of the Santo Sepolcro, etc.